As Kenyan athletes line up for the 123rd edition of Boston Marathon on Monday in the USA, they will have to conquer both opponents and extremely cold conditions. Last year's edition of the race was run in cold and windy conditions that made it hard for Kenyan athletes to perform well in the full marathon. More than 25 elite athletes dropped out of the race. This years' edition will see a number of past winners trying to win the race again after good preparations back at home. World Marathon champion Geoffrey Kirui, who is the 2017 winner, will be seeking victory again after coming second last year. "Last year I was well prepared to retain my title but things changed when it started raining. It reached a point my body couldn't react anymore. We have been told it will be cold today but we shall just wait and see," Kirui told Nation Sport on phone from Boston. Amsterdam Marathon champion Lawrence Cherono who is the fastest in the field (2 hours, 04min and 06 secs) will also be chasing victory. "In the last three months, I have been preparing for the big race. I'm happy my training was injury-free. I love training in Kaptagat because it always brings out the results in all the races I have participated in," Cherono, who runs under the Rosa Associati stable, said. 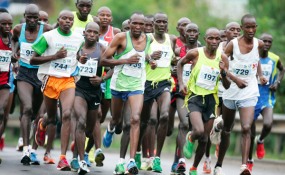 Another past winner, Wesley Korir, who has been training in Eldoret will be eyeing a podium finish in the race as he eyes a repeat of his 2012 performance when he crossed the line first. The 2018 Rotterdam Marathon champion with a Personal Best of 2:05:44 is among the athletes to watch in the race alongside 2017 Toronto Marathon champion Philemon Rono who has a Personal Best of 2:06:52. Others are Toronto Marathon champion Benson Kipruto, Felix Kandie and two-time Eindhoven Marathon title holder Festus Talam. The athletes will face stiff competition from Ethiopians, among them 2015 winner Lelisa Desisa, Solomon Deksisa, Lemi Berhanu and Sisay Lemma. Eyes will also be on Eritrea's Ghirmay Ghebreslassie and the defending champion Yuki Kawauchi from Japan. In the women's race, 2017 winner Edna Kiplagat will line up alongside former winners Sharon Cherop (2012) and Caroline Rotich (2015), and former Paris Marathon champion Betsy Saina against Ethiopians former Dubai Marathon champion Aselefech Mergia, former world marathon champion Mare Dibaba, Worknesh Degefa and defending champion Desiree Linden (USA).